Usain Bolt ain’t got nuttin on this hotness. This is long (almost a month!) overdue, but I thought today would be as good a time as any to discuss my meal with Alex at Seasons 52, as it is most likely to be the venue for our joint bday dinner this weekend. So consider this a backward- and forward-looking WIAW. Thank you to Jenn, as ever, for hosting this food party (all for meeeeeee!). Seasons 52 opened in the Chicago market this past fall, and I have been aching to go for months, but both Alex and I were insanely all over the place, and it just never felt like the right time. And then we started our new tradition of happy hour and early dinner, and I noticed a little something that Seasons 52 offers that was too perfect for us to pass up. 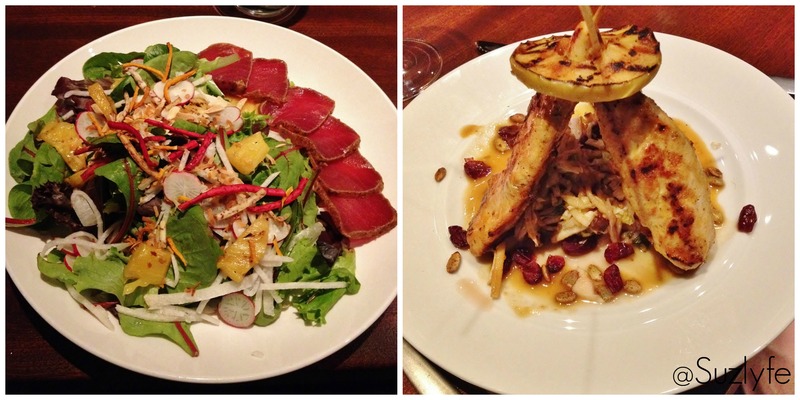 The Seasons 52 menu is seasonally-inspired with the fresh appeal of the farmer’s market. It represents a unique blend of art and science, with creative offerings designed to excite and surprise the palate. We feature dining choices that are thoughtfully prepared and in appropriate portion sizes. So our guests feel the freedom to indulge in a complete dining experience, including our custom flatbreads and signature mini-indulgence desserts, while still feeling good about themselves and their dining choices. We use natural cooking techniques such as wood-fire grilling, brick-oven cooking and caramelizing vegetables to let the natural flavors shine through. And we execute precision with seasoning, and oil with control and care to ensure just the right amount is used to bring out the great flavor profiles. An added benefit to this style is that our menu items are naturally lower in calories. In fact, we make a promise that nothing on our menu is over 475 calories. The result is great tasting, highly satisfying food that just so happens to be good for you! Sounds pretty awesome to me, and right up my alley, yes? If you have paid attention to my food choices, the way that I cook, or just read any of my posts on food, you will know that I prefer simple, clean flavors that sing on the palate, but where you always taste the intrinsic value and gift of the ingredients. Furthermore, my body does not absorb overly rich, oil-laden foods, especially those that feature milk, oil, and butter. I am lucky to be at the point in my disease where I can have a bite or two of pretty much anything (cheeseburger, fries, pizza, heavy pasta, super premium ice cream) but that is about it. Basically, those things I grew up living off of? Not so much a part of my diet. That doesn’t mean that I don’t help Alex with his 😀 but I am unlikely to order my own portion, or at least to order my own portion and expect to feel well later on. I love the fact that the chefs at Seasons 52 dedicate themselves to present food without pretense, but to a exacting degree–Finally, a place where I can basically eat anything on the menu because it isn’t hiding anything behind the crutches of added oils and fats! Cook it dry (with light oil or spray), but bring on the avocado!! Ok, so what did we get? A LOT. 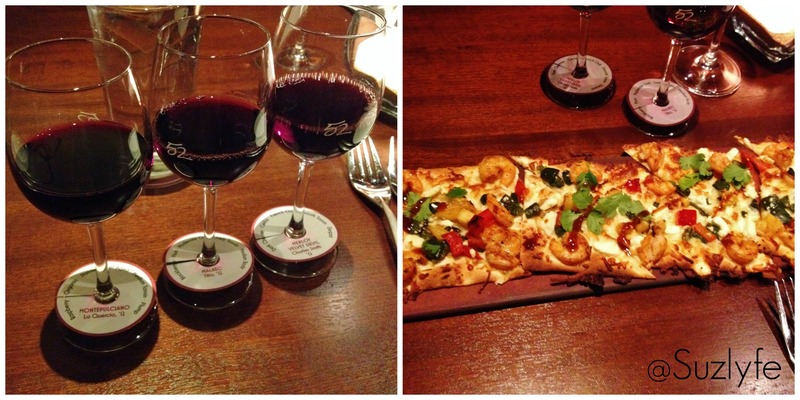 SOmething that I discovered that afternoon, and lead to us deciding to go that night, was the Seasons 52 Happy Hour Flights and Flatbreads–you get a flatbread and a trio of wines to taste, with a full pour of whichever is your favorite! We went with a single order (to share the flatbread and wines, and then to order an additional glass of wine–his fave (the remainder of the happy hour) and my fave), and got the “Remarkable Reds” selection (La Quercia, Montepulciano (Abruzzo); Charles Smith, Merlot Velvet Devil (Washington); Tilia, Malbec (Mendoza)) and a spicy Chipotle Flatbread. The flatbread was EXACTLY what we wanted, and HUGE! Super thin and crispy crust (we know that I like this, ahthankyavermuch), and evenly decorated with grilled pineapple, shrimp, and cilantro. Thank goodness we didn’t get 2 orders! What a deal! I loved this flatbread–as Alex said, it was the perfect “Susie” pizza! But don’t worry, I shared. And I let him pick the first wine. Soooo generous. We ultimately decided on the Merlot and Malbec, choices that I was actually surprised by because we are huge Montelpulciano d’Abruzzo fans. But in this instance, and with this dish, the others were better choices for us. Also? I love that they used little tasting glasses for the samples, and also put little disks on the stems so that you always knew what you were drinking. A great touch for a casual atmosphere. We had a TERRIBLE time–in a good way–deciding what to get next, at least for Alex. I had been eyeing the Maui Tuna Crunch salad, and only brief waffled away from that. It took us a while (thank goodness for the flatbread, lol) but Alex ultimately decided to start with a butternut squash soup, garnished with shittake mushroom chips and fresh chives. MMMmmmmmmm like fall/winter in a cup, and served with a slice of delicious wheat bread. We also got the double hummus plate with Sea Salt Lavash (I love lavash btw), minted edamame hummus, and roasted red pepper hummus. I am not crazy about red pepper hummus, but it was quite good, and the perfect texture. The minted edamame hummus was really tasty. The mint was subtle, but gave a gentle lift, and the edamame gave a new take on the traditional hummus. And I could live off of lavash. With ice cream, obviously. I got what is perhaps the simplest side in the history of sides, but we both loved it: golden beets with wasabi dipping sauce. ERMIGERD. All of the awesome, none of the work, a good portion, nothing added but seasoning, and the sauce was FABULOUS. I did commit to the Maui Tuna Crunch salad, and it was perfection for me–the tuna was spot on with the sear on the exterior and the rare middle. A fantastic surprise were crispy strips of what I believe to be taro, beet, and the like (like those Terra chips, you know?) and I loved the little salty crunchy of that with the pineapple, toasted almonds, and a soy reduction and sesame dressing. And the wasabi dipping sauce. ERMIGERD. Alex selected the Cider Glazed Chicken Skewer with a Fuji Apple Slaw, another great choice and TOTALLY different from my selection–point and counterpoint. So earthy, homey, and comforting, and I loved the fuji apple slaw. But I was all about working my way through the other half of the table. 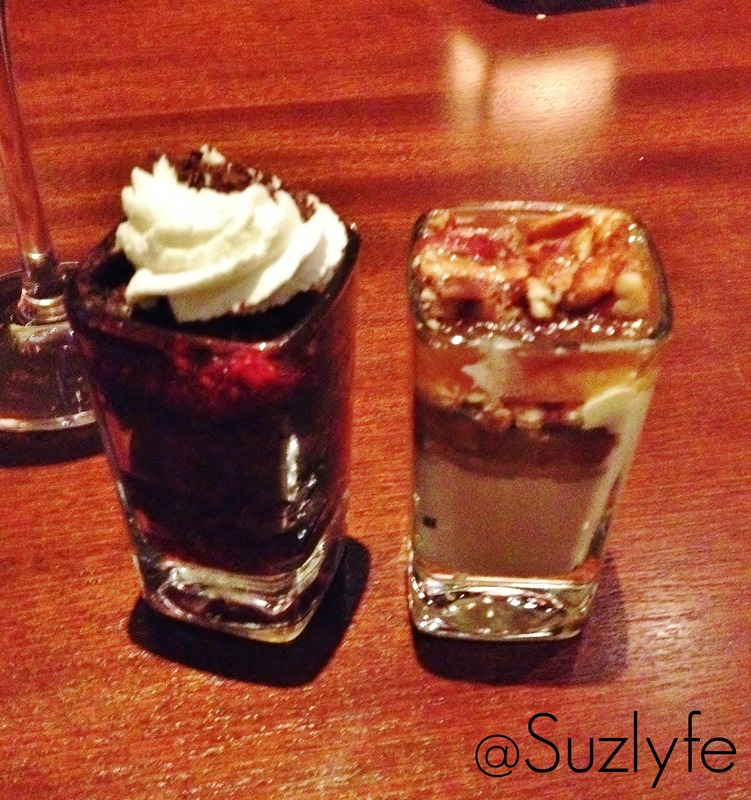 Not something you often find with us, though we have been known to dabble, but here is amazing thing about Seasons 52–they basically invented the mini dessert. And bless them for doing so. When it is time for dessert, they don’t just bring out a tray of fake desserts, no, they bring all of the options to you, right then, you select, and you take. Like a conveyor belt of awesome, but not moving. As in, able to be captured. There are 8 to choose from, but we ended up going with a chocolate chip brownie with raspberry sauce (it was brand new, too) and the pecan pie. I. Die. of fullness, happiness, and yumminess. Just. Awesome. I won’t describe them too much, because you can imagine, but let me just say that it was my perfect idea of desert–just the right amount, just the right richness, and the perfect opportunity to get a little bit of whatever you wanted. Our meal at Seasons 52 was fabulous, and not just because of how delicious everything was (as evidenced by the fact that NO THING was left. As in, we did better than the “dishwasher” dogs), or the fact that our entire meal was only a bit over half what it would be anywhere else. Our water (I think his name was Jay?) and the rest of the staff made the experience–they were incredibly polished, attentive, and eager to help, to inform, and to explain the way the menu works. And the food was prompt, but neither it nor we were rushed. I cannot emphasize enough how impressed we were with the food, the service, and the ambiance. We will (obviously) be going back. Yes, we love to go out and have the duck fat fries at Roof, or share some cheese curds at Farmhouse or Sable. But at Seasons 52, I didn’t have to be worried about ordering anything–all I had to do was to get the dressing on the side, and otherwise it was ready to go. And Alex was able to indulge without feeling gross, as sometimes happens for the boy. I will keep you all updated with our new selections after we go next time! I hope you all have a great day–I will be spending it as I normally do, for the most part, but Alex and I are going to a screening of “Finding Strong” with Bart Yasso and Fleet Feet tonight, so a little treat for the birthday girl 😀 And maybe a free Sbux drink. Have you ever been to Seasons 52? Are you a sampler–as in lots of small plates or a bit of everything a la a salad bar–or do you prefer the single, large entree? Do you demand that your birthday be celebrated on the day of, or is it ok to move it around? Or just go whole hog all week?